A southern Alberta cryptocurrency mine — the self-proclaimed largest publicly traded company of its kind in the world — has announced a second round of layoffs this year, as the price of bitcoin struggles to recover. 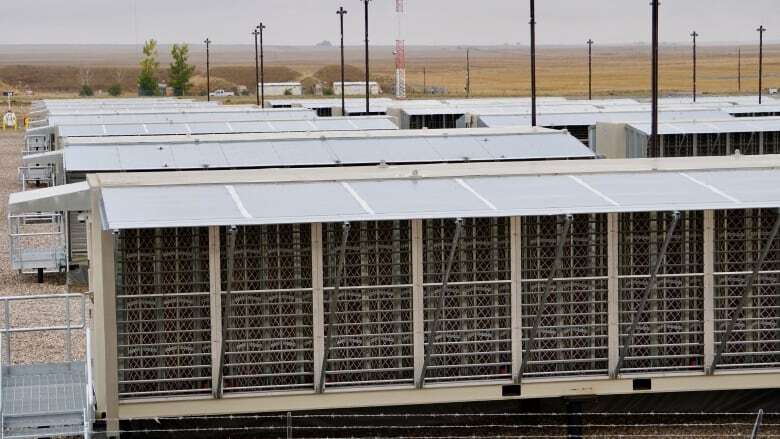 Hut 8 operates 85 data centres in Drumheller and Medicine Hat in partnership with blockchain technology company Bitfury. Bitcoins are mined by using computers to solve complex mathematical equations that confirm cryptocurrency transactions. Confirmed transactions are added to a public ledger called the blockchain, and the miners are rewarded in bitcoin for their work. Hut 8 has mined 7,300 bitcoins since its servers first switched on in December 2017. That's the same month the coin's price soared to a record high of nearly $25,000 Cdn, before plunging two months later to nearly half that. On Thursday, bitcoin was trading around $6,600 Cdn — the highest its price has been in about five months. CBC News spoke to a former Bitfury employee who worked at the Drumheller Hut 8 facility. He was let go, along with about two dozen coworkers, in January. His identity is being kept confidential to protect his current employment. He said he believes about a quarter of the company was laid off globally at the time, with a much higher percentage in Alberta. "Power prices were going up, and bitcoin was going down," he said. "In Drumheller, we were expecting some form of layoff but not in the mass amount that we had. At the time, we were just starting to be up online, be completely streamlined. "The plan was maybe laying a couple people off per shift but it ended up that probably half of the data centre ops crews were let go." Bitfury would not confirm the number of employees laid off this week, or in January, but a company spokesperson said the layoffs were part of an effort to streamline operations. "﻿As Bitfury grows, we are constantly evaluating ways to better empower our company to perform efficiently — in 2019 and beyond," the emailed statement read. "As part of those efforts, we are streamlining our operations in order to help us advance strategic plans to develop innovative software and hardware solutions and focus on other emerging technologies. This week's actions reflect those efforts. This decision will enable us to lead the company into our next chapter of growth. We sincerely appreciate everything our team members have helped us accomplish." Bitfury is valued at more than $1 billion US, according to Forbes. In Hut 8's third quarter, it reported a record revenue of $17.7 million Cdn and a net operating loss of $11.1 million Cdn. Its cost to mine a bitcoin in its third quarter was approximately $4,500 Cdn, giving it a mining profit margin of around 51 per cent. Hut 8 said a few things have impacted the profit margin in recent months: increased competition with other bitcoin miners and record-setting summer temperatures that caused electricity prices to go up at its Drumheller facility.